During the first 12 months of the program, those who were eligible for the SSP were less likely to find a job: since the SSP premiums were only available to those who had been on social assistance for a year, some of those who might have found a job within the first year decided to wait for the premium. Once they were eligible, the change in behaviour is dramatic: during the second year, some 25% of the SSP group found a job, compared with 8% of the control group. But what's curious is the employment patterns after that. In the SSP group, the employment rate levels off, but the control group's rate continues to rise. After the fifth year of the program, there's little to choose between the two employment rates. 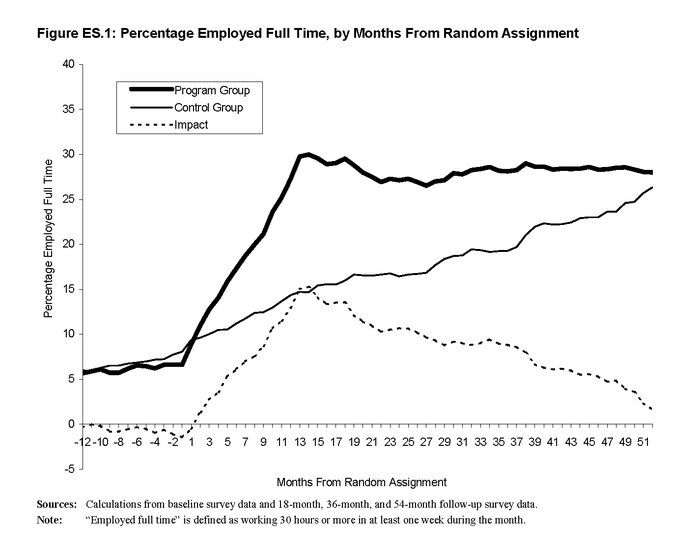 So the long-run effect of the SSP program appears to be pretty small: all it really ended up doing was to move forward the decision to look for a job among those who would most likely have gone back to work anyway. From a policy standpoint, the SSP experiment was a bit of a disappointment ('oh well, back to the drawing board'). But it's a neat illustration of how people respond to incentives. Thanks largely to increases in the value of oil exports, the Canadian dollar has appreciated by 40% against the USD since the beginning of 2002. So you'd think that our manufacturing sector would be getting hammered, right? After all, that's the classic Dutch disease scenario: the high demand for natural resource exports drives up the exchange rate, which makes the manufacturing sector uncompetitive in world markets. So how is Canada's manufacturing sector holding up these days? The newly-elected Parliament has begun its first session, and the first couple of days have been taken up with the usual rituals: the election of the Speaker of the House of Commons, the Gentleman Usher of the Black Rod, the Speech from the Throne, and the use of Any Number of Capitalised Words to Describe it All. In short, Democracy at Work. But economists know that this is all window-dressing. The really important decisions have already been made, in secret, by an unelected group of people whose names are not released to the public. As a follow-up to this post, here are the US and Canadian yield curves from March 2006 and December 2005. The difference between US and Canadian inflation rates has been pretty stable over the past couple of years (Canadian CPI inflation is about one percentage point less than in the US), so it would appear that the market is expecting the CAD to appreciate even further against the USD over the next couple of years.